We now give her Wafcol for her meals as well as most of her treats - she comes running for a bit of kibble! We are very happy customers!! Belle first started to show signs of allergies when she was about 18 months old – she would not be able to cope with people stroking her at all. She would say hi to strangers and they would delight in finding her “tickle spot” but in fact it was her whole body, and even a small stroke would set her off. We treated her for parasites regularly but tried switching brands to solve the problem before considering dietary causes. We had her on two exclusion diets and by the time she was 3 she looked a terrible state – dandruff had turned into scabs as she scratched herself raw. She would also occasionally vomit or suffer diarrhoea in the night… we were just so upset for her. 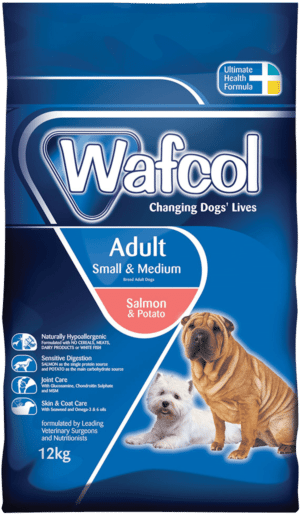 Our vet said we should perhaps try Wafcol once we realised that Belle couldn’t tolerate chicken, and the salmon and potato kibble helped a lot. The final part of the puzzle clicked into place when we decided to completely cut any grain based treats from her diet. Since then she has had virtually no problems at all – she is a fish lover for life. It is wonderful to see her back with a glossy coat, no sensitive spots. She is a much happier girl and we now give her Wafcol for her meals as well as most of her treats – she comes running for a bit of kibble! We are very happy customers! !